Never had any issues either in Windoze or the Linux version that's also updated. Used without any negative effects. For those who are able to set a restore point, set one before use. If a problem is encountered, go to the restore point and the problem should be solved. That is, if you are able to boot up. Try safe mode first though. This just keeps getting better and better all the time. 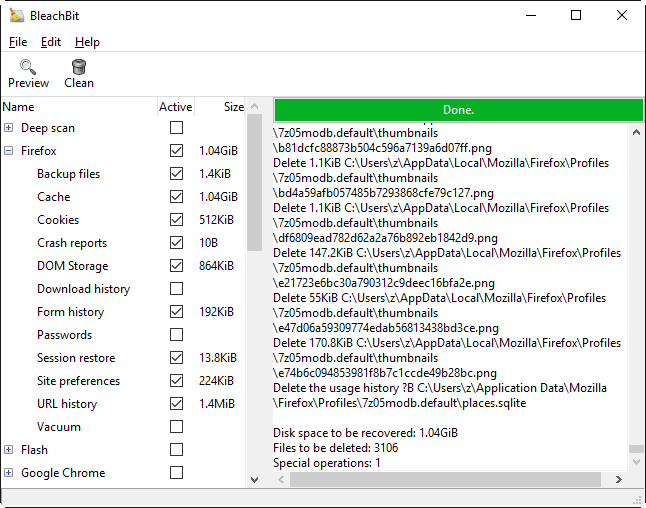 I need to run this application first on slow computers that are heavily laden with junk files and privacy trackers in order for CCleaner to work properly. If I don't CCleaner pretty much freezes during analysis. I took a chance and used this application, and then spent a full day trying to repair the damge it caused. If you use this, be VERY carefull. It may delete important system files. Open source and awesome. 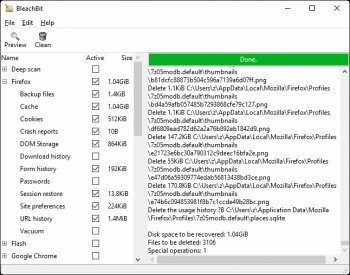 This app disinfects what little CCleaner along with CCenhancer misses. It's been a while since an update was published, so I'm glad to see this project is still alive. The only problem I have is that it will work for a day or two and then simply show the error log message and refuse to open at all. Strangely whenever I have tried to fix that by deleting the portable version's folder and starting over it does the exact same thing. It uses ccleaner's winnapp2.ini file. If this problem occurs again I may have to switch to cc. It will not update through a proxy either. Plus, even if there is an 'error' log, I'd prefer to not have to close the notification every single time I run the ap. It needs the ability to simply be ran and do what it needs to do and then close all by itself without having to click (your heels) 4 times. The previous portable beta left no seemingly apparent files, folders, or registry entries after I deleted it. Open source and does the job. Make sure you do a quick backup of your bookmarks or favorites first so that you can restore them after bleaching the hell out of your browser. This app really disinfects your browser from all history. I highly recommend it. Have this on my Ubuntu installation, and have tried on Windows as well, but the thing is, that you have to look at what the program is going to delete! Cannot just say "what the hell" and let it delete everything randomly. Again, have used on Ubuntu with no problems, but on Windows, please use caution, is powerful, can free up a lot of space, but be careful. I've installed & un-installed this program twice. I must say it's a bit on the harsh side for me, I believe it is responsible for causing Outlook 2010 not to open after using bleach. As I image often it's not a problem, & I'll give bleach another whirl when it's out of beta whenever that will be, or maybe the next beta. Took a 4 gig drive that had been formatted to FAT32 with Win 95 on it from an old computer, reformatted to NTFS on Windows XP. Then ran BleachBit with the System -> Free Disk Space on it, hoping to wipe out all old data. Once completed, ran Recuva on it, and it recovered around 1100 files, including images and complete word documents that would still open in MS Word. So don't rely on it to makes files unrecoverable from free space on a drive. The largest file recovered was a 1.6 Mb mp3 file. Only app I know if that does a vacuum of both Firefox and Thunderbird. Cross platform, community supported, rapid development and regular updates. Amazing app.